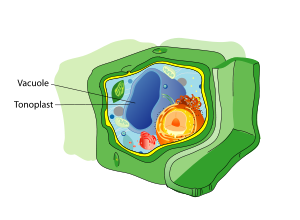 A vacuole (/ˈvækjuːoʊl/) is a membrane-bound organelle which is present in all plant and fungal cells and some protist, animal and bacterial cells. Vacuoles are essentially enclosed compartments which are filled with water containing inorganic and organic molecules including enzymes in solution, though in certain cases they may contain solids which have been engulfed. Vacuoles are formed by the fusion of multiple membrane vesicles and are effectively just larger forms of these. 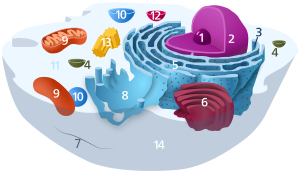 The organelle has no basic shape or size; its structure varies according to the needs of the cell. 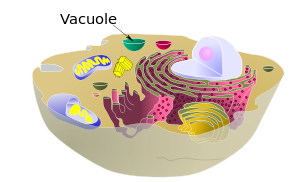 Vacuoles also play a major role in autophagy, maintaining a balance between biogenesis (production) and degradation (or turnover), of many substances and cell structures in certain organisms. They also aid in the lysis and recycling of misfolded proteins that have begun to build up within the cell. Thomas Boller  and others proposed that the vacuole participates in the destruction of invading bacteria and Robert B Mellor proposed organ-specific forms have a role in 'housing' symbiotic bacteria. In protists, vacuoles have the additional function of storing food which has been absorbed by the organism and assisting in the digestive and waste management process for the cell. Gas vacuoles, which are freely permeable to gas, are present in some species of Cyanobacteria. They allow the bacteria to control their buoyancy. ^ a b Heide N. Schulz-Vogt (2006). Vacuoles. Microbiology Monographs. 1. doi:10.1007/3-540-33774-1_10. ISBN 3-540-26205-9. ^ a b Becker B (2007). "Function and evolution of the vacuolar compartment in green algae and land plants (Viridiplantae)." (PDF). International Review of Cytology. 264: 1–24. doi:10.1016/S0074-7696(07)64001-7. PMID 17964920. ^ Kalanetra KM, Huston SL, Nelson DC (December 2004). "Novel, attached, sulfur-oxidizing bacteria at shallow hydrothermal vents possess vacuoles not involved in respiratory nitrate accumulation". Appl. Environ. Microbiol. 70 (12): 7487–96. doi:10.1128/AEM.70.12.7487-7496.2004. PMC 535177 . PMID 15574952. ^ Walsby AE (1969). "The Permeability of Blue-Green Algal Gas-Vacuole Membranes to Gas". Proceedings of the Royal Society of London. 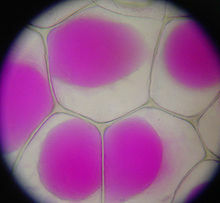 Series B, Biological Sciences. 173 (1031): 235–255. doi:10.1098/rspb.1969.0049. ISSN 0080-4649. OCLC 479422015. ^ Li, WING-YEN; FUK-LING WONG; SAU-NA TSAI; TSUI-HUNG PHANG; GUIHUA SHAO; HON-MING LAM (June 2006). "Tonoplast-located GmCLC1 and GmNHX1 from soybean enhance NaCl tolerance in transgenic bright yellow (BY)-2 cells". Plant, Cell and Environment. 29 (6): 1122–1137. doi:10.1111/j.1365-3040.2005.01487.x. PMID 17080938. Retrieved 23 October 2011. ^ D J Klionsky; P K Herman & S D Emr (1990). "The fungal vacuole: composition, function, and biogenesis". Microbiol Rev. 54 (3): 266–292. PMC 372777 . PMID 2215422. ^ Reggiori F (2006). "Membrane Origin for Autophagy". Current Topics in Developmental Biology. 74: 1–30. doi:10.1016/S0070-2153(06)74001-7. PMID 16860663. This page was last modified on 16 October 2016, at 02:30.